If you’re one of these people (like me) who can get really busy organising Christmas dinner, focusing on the main dish, the decorations and everything that comes with it, but do not pay attention to the side dishes… Then this recipe is for you! 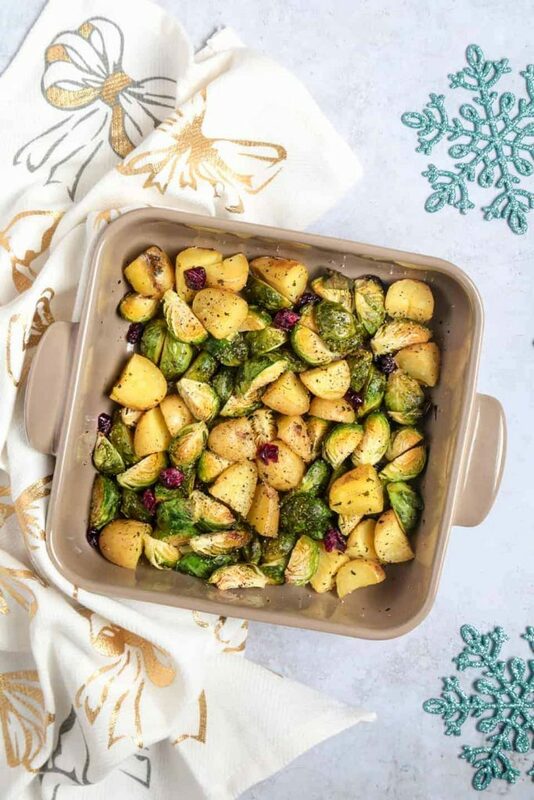 This is a lovely vegan Christmas side dish recipe made with roasted brussels sprouts, baby potatoes and sweet cranberries. The honey glaze that comes with it is also divine! What’s so special about this side is that it suits all dietary requirements, so you won’t have to worry if your guests would be able to eat it or not. Plus, it makes a lovely centre piece as it looks very festive and beautiful! At this time of year Brussels sprouts can be found everywhere, they’re usually grown locally and come in a bag or whole on a stalk. If you want to keep them fresh for longer them buy sprouts on the stalk, they’ll stay fresh for longer as the stalk keeps the moisture in. 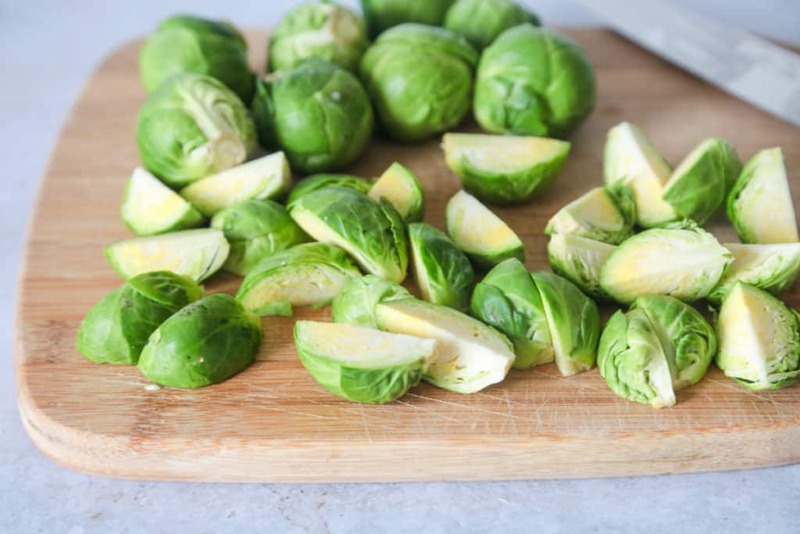 Sprouts are very popular at this time of the year not only because of Christmas, but because growers know that the best-tasting ones will be picked now, when the cold causes the sprouts to produce sugars. Demonstrating that once again, eating seasonal food has many advantages. The bigger sprouts are not necessarily the tastiest, in fact, the smaller they are, the more tender and sweet they’ll taste. The bigger ones are more like cabbage. My family love roasted vegetables during winter! I pretty much roast everything, pumpkin, potatoes, Brussels sprouts, carrots, parsnips, bell peppers, and even garlic! I really think that root vegetables taste so much better roasted as they get slightly caramelised, and that’s what makes the flavour so special. 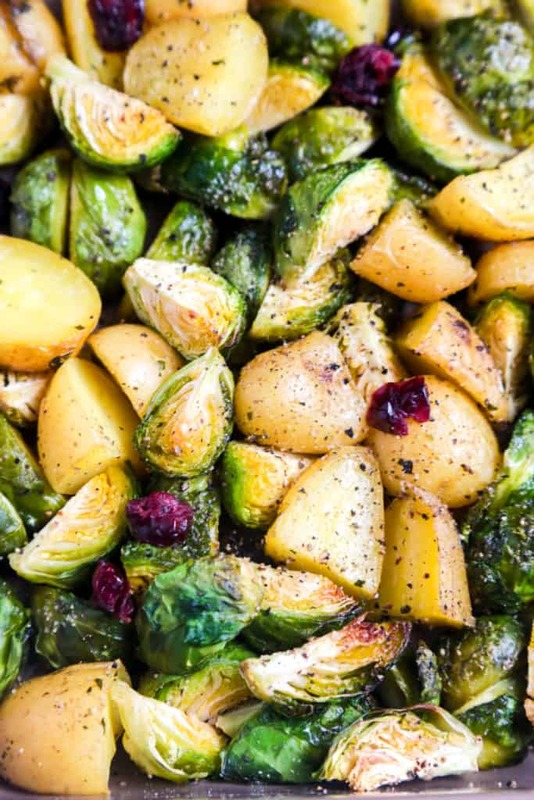 This Christmas side recipe gives the most flavour out of the sprouts and baby potatoes by slicing them in half or quarters, so they sear when you pop them in the hot oven, locking the flavour in. Preferably choose sprouts and baby potatoes of a similar size as they will cook easier that way. Another great veg to roast is baby potatoes. They hold their shape well when roasting, and they don’t require peeling, saving me precious time I can spend with my family! As for the cranberries, you will need to use sweet dried cranberries instead fresh ones or frozen ones as they are too sour. When the cranberries are too sour they can spoil the desired flavour of this recipe, while sweet dried cranberries are just perfect for this dish and they bring the most of the flavour when paired with sprouts and baby potatoes. Just remember to soak them first in water to make them juicy, and they’ll give lots of flavour. I just love their deep red colour, it makes this Christmas side dish of Roasted Brussels Sprouts with Potatoes and cranberries look so festive, they’re like edible jewels! It’s also worth mentioning that cranberries are really good for you and have many health benefits: they contain phytonutrients and have antioxidant properties, they’re a source of vitamin C, vitamin E, manganese, copper and dietary fibre. I use them in lots of dishes, savoury or sweet! Once you’ve prepared everything, the Roasted Brussels Sprouts with Potatoes and cranberries go into the oven for 30 minutes, and you’re nearly done. Drizzle a little bit of runny honey and stir it in, sprinkle sea salt and that’s it! You have a simple and delicious side dish ready to be served! If you’re vegan you can substitute honey for maple syrup of agave nectar it’ll work very well. Not all ovens are big enough for two trays especially when roasting several Christmas dishes so if you have to take the side dish out the oven when it’s done, transfer it to a pot and put the lid on. Now place the first pot in a larger and deeper pot or pan and pour boiling water in the pan, about two inches deep. Put the two pots on a source of low steady heat and that will keep the food warm without over cooking it. See? You have to plan everything when cooking big dinners and this method will work very well for this roast vegetables dish. My Mum taught me this method, and uses it every year when she’s cooking a massive Christmas dinner, or when we have an occasion and she’s cooking for a big number of people. Don’t hesitate to make plenty of this easy vegetarian side dish as it will be perfect with Christmas dinner trimmings the next day, it’s nice to know you don’t have to prepare a big dinner all over again when they are plenty of yummy leftovers to feed a crowd! I had no idea that the small sprouts taste sweeter than the bigger ones! Thanks for the tip! definitely looks like a great side dish! I love roasting veggies this time of year, and the cranberries are a nice touch. This looks like such a great Christmas side dish! I’ve just recently fallen in love with Brussels sprouts. Love that you added cranberries. It looks delicious. Ah… we are on the same page! We made a similar dish just earlier this week. Love brussels sprouts and this looks delish!